LONDON, Sept 2, 2011 (AFP) - A council tasked with drafting a constitution for Libya should be elected within eight months ahead of presidential and legislative polls in early 2013, a rebel leadership official said Friday. "We have outlined a clear road plan, a transition period of about 20 months," Guma al-Gamaty, the National Transitional Council's representative in Britain, told BBC radio. He said the process of transition was already under way and the NTC would move properly to Tripoli within a few days. 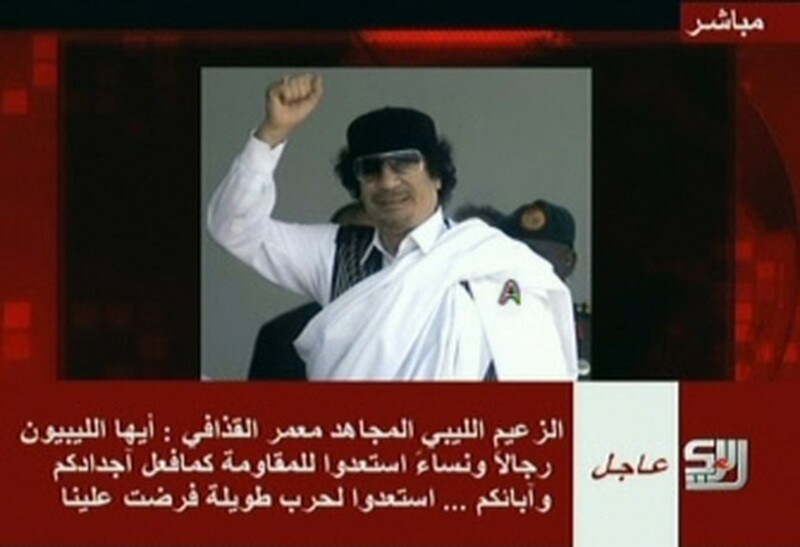 AFP - An image grab taken from the Syrian-based Arrai television shows a picture of Libyan leader Moamer Kadhafi as he allegedly gives an audio message from an undisclosed location on September 1, 2011 to mark the 42nd anniversary of the coup which brought him to power. For the first eight months, the council would lead Libya, at the end of which time a council of about 200 people should have been directly elected, Gamaty said. "This council ... will take over and oversee the drafting of a democratic constitution, that should be debated and then brought to a referendum," he said. Within a year of the council being put in place, final parliamentary and presidential elections should take place, he said. "So we have eight months and a year that will take us to final elections with both parliamentary and presidential elections," said Gamaty. "And then hopefully by the end of about 20 months, the Libyan people will have elected the leaders they want to lead their country."